Nose: Fresh. There is a mineral side with chalk, wet clay, but what’s great are these big wet foliage notes, remember the smell of morning dew in the fields before 5BX? Crushed ferns and clean earth. Gentle whiffs of petrichor, but also clean scrubbed pans, dried out lime zest, and a crystalline blade of minerals. Very ‘true’, and with a touch of earth. Nevermind 40%. Palate: More upfront syrup sweetness here with but no the chalk and minerals come on strong. Now we find the zesty warmth of limes and some mulch plus these big greens make it a great combination. A whole palette of greens, that runs from some nice warms herbals and turns to hot eucalyptus and ginger towards the finish. Finish: Not the longest but fresh, sappy and zesty. Great easy drink. Nose: Right very different. This one is phenolic! Soot grease snubbed out candles, and charred things. Also quite some sherry influence, but it’s the dry aromatic sort, and yet touches of burnt nuts. Do you remember that pasty date and walnut candy that came wrapped in colourful cellophane? Preserved olives, shrivelled purple fruit and a christmas-y port jam. Touches of Mentholatum and camphor rubs. I find great balance in the sherry, not too overbearing, but present and the done just right. Palate: Dry elements coming through, soot and greasy rags, but also desiccated plum skins, dried out blackberry jam jars. Hints of ash and charred bits. Tad bit gristly and smokey with these burnt ends. Drops of molten tar, aniseed drops and soy. Mushy preserved fruit, and presenting a growing liquorice side to it now. Finish: Quite long really, puckering-ly dry, quite heavy on the licquorice with overtones of dried fruit. Again not at all hurt at 43%. Frankly an amazing Bladnoch. 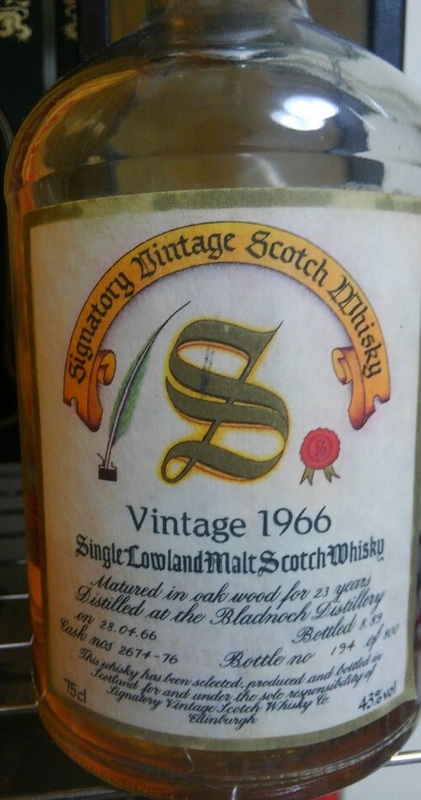 This entry was posted on August 12, 2018 by Whiskyrific in Bladnoch and tagged Bladnoch.